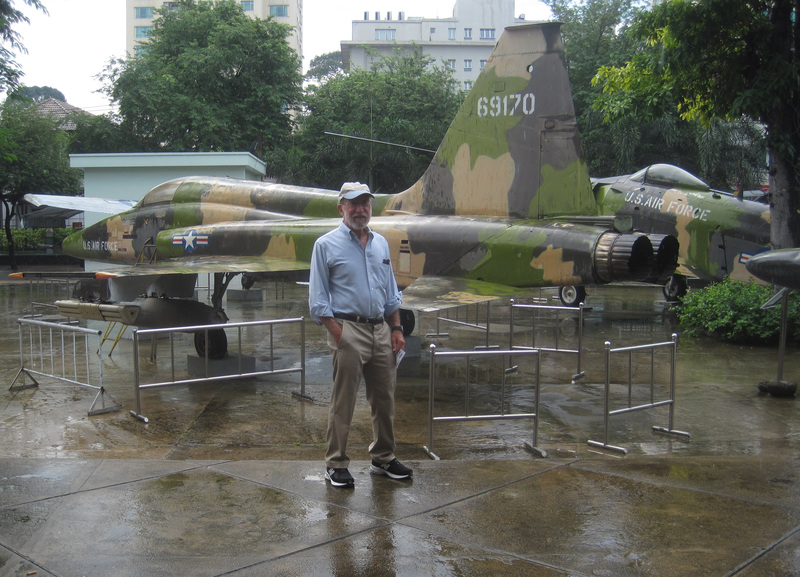 We recently returned home from our trip to Myanmar (formerly known as Burma). The highlights included several days in the archaeological area of Bagan, visiting hundreds of old temples. We also enjoyed seeing numerous religious buildings, covered in gold leaf and jewels, containing many sculptures of Bhuddha. It was a thrill to walk along the streets of the fabled cities of Mandalay and Rangoon (now known as Yangon) and see the fascinating culture on Inle Lake. We were pleased with the pace of the trip. Often we are scheduled for too much “rest” time and we were happy to be “on the go” almost all day. The hotels we stayed in were very nice. The location of the hotel in Bagan was so convenient to walk and discover temples on our own. 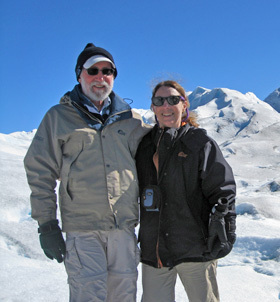 Our guide, Simon, was with us for 13 days and AK was with us for three days. They were both very professional and friendly. 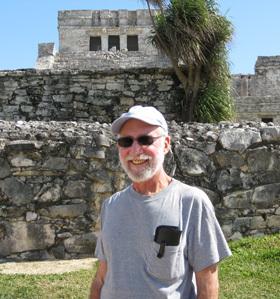 Simon was charming and always wrote down the names of the places we visited during each day. They both always arrived on time and even came early. The drivers were polite and drove well. Thanks for organizing a great trip for us. Young monks in Myanmar taking their daily meal. This month, President Obama will become the first U.S. President to visit Myanmar (Burma). This historic visit will focus even more attention on this Southeast Asian country and its efforts to rejoin the international community. For the last eight years, The California Native has been conducting tours in Myanmar. We invite you to join us before too many tourists discover the beauty and serenity of this destination. 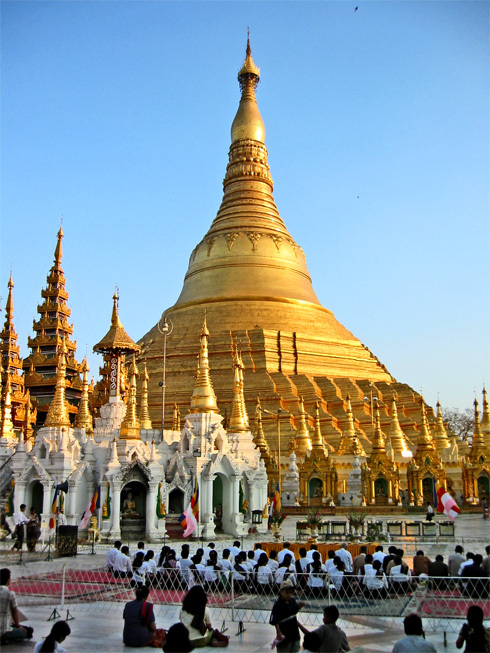 The Shwedagon Pagoda, located in Yangon, is the most sacred Buddhist site in Myanmar. The pagoda, purported to be 2,500 years old, enshrines strands of Buddha's hair. In Myanmar, a family celebrates a young boy's becoming a noviate monk. Most young boys between the ages of 8 and 12 in Myanmar spend time wearing monk's robes and living in a monestery. Built in the 1800's, The U Bein Bridge, in Amarapura, Myanmar, is the world's longest teak bridge at 1.2 km. In Myanmar (Burma), one group of indigenous people that really stands out are the Padaung women of the Karen people, sometimes known as “long-neck” tribe. At first glance, it looks as if the women are wearing gold rings to elongate their necks, but actually, this is not physically possible. The long neck is really a visual illusion. 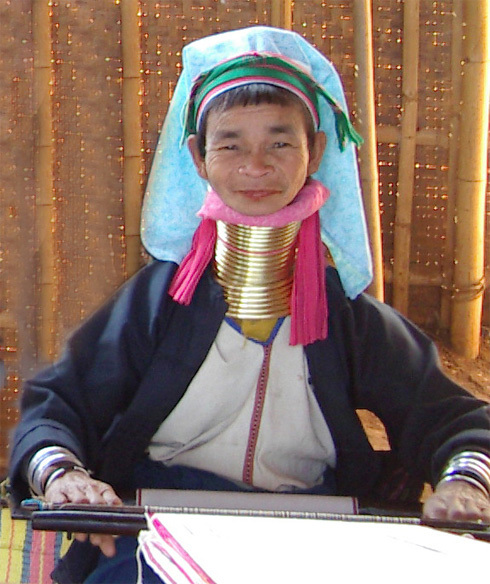 The women wear metal rings, whose weight pushes down their collarbones and upper ribs to such an angle that the collarbone actually appears to be a part of the neck, giving the illusion of an unnaturally long neck. The most common explanation for this practice is that the look of an extra-long neck is a sign of great beauty and wealth, which will help attract a good husband. Some also say the opposite; that it is done to make the women unattractive so they are less likely to be captured by slave traders. Padaung mythology says the reason for the neck rings is to prevent tigers from biting them. It is also said that adultery is punished by removal of the rings. If the rings are removed after years of wearing them, the woman must spend the rest of her life lying down since the neck muscles will have been severely weakened by years of lack of support for the neck. Luckily, the instances of divorce and adultery in the Karen tribe are very low. 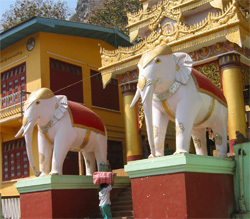 Statues of White elephants guard the entrance to a temple in Myanmar. In Myanmar (Burma), the white elephant is highly respected as a symbol of power and prosperity and so it was only natural that a few months ago Myanmar’s government warmly welcomed two newly found white elephants. At the same time, the country was awarded chairmanship of the Association of Southeast Asian Nations for 2014, and U.S. Secretary of State Hillary Clinton’s visit ended 50 years of political isolation from the West. Coincidence? The people in Myanmar don’t think so. The elephant has for centuries been a symbol of Southeast Asian countries. Maharajas sent them to battle like living tanks, and workmen used them as bulldozers. The rare “white” elephant, though, holds a special place in the lore of these countries. 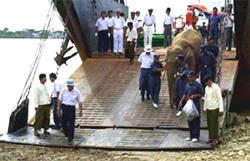 A white elephant is unloaded from a transport to take its place of honor near a temple in Myanmar. While other elephants worked hard, white elephants were cherished by kings, kept in palaces, cared for by senior officials, and worried over constantly. Possession of these sacred beasts was very important. A king who had many white elephants would reign for a long time and his kingdom would prosper. If his white elephants died, it was an omen of disaster for the kingdom. Burmese kings would hunt for these special beasts, and would present them to each other as marks of diplomacy. Sometimes they fought over them, but they always took great care of them—their rule depended on it. As elephants were used less and less in warfare, elephant hunts became less common, and fewer white elephants were discovered. In Siam (now Thailand), the King decreed that any white elephant found must be given to him and he offered rewards for their discovery. Each time a white elephant was found, it was cause for public celebration. When King Mongkut of Siam heard that America had no elephants, he offered to send several to President Lincoln, thinking that if conditions were right they would multiply and Americans would be able to “tame and use them as beasts of burden, making them of benefit to the country.” The President replied that the American climate was probably unsuitable, and Americans preferred to use steam power, but he thanked the king for his gift of two magnificent tusks. Brahman texts list attributes which must be met to qualify the animal as a true “white” elephant—pearl eyes (the animal is usually an albino), white hoofs, a back which hangs down like the bough of a banana tree, white hairs on the body and tail, and ears which are larger than a regular elephant’s. Today, in Laos, Cambodia, Viet Nam and Thailand, white elephants are pretty much nonexistent. In Myanmar, with the two new white elephants, the country now has at least five. They are considered sacred, and treated with the utmost respect and care. At certain times of the day, the public may view the elephants. No photos are allowed. 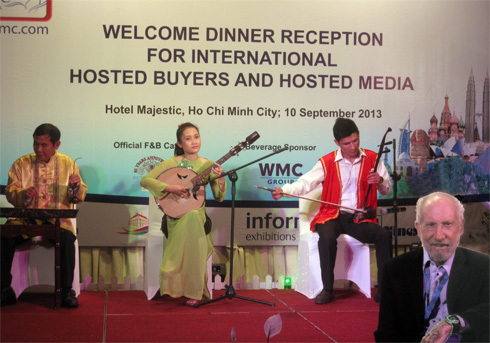 With its new found popularity, Myanmar is on its way to becoming a major tourist destination. Tourist numbers are going up and so are prices. 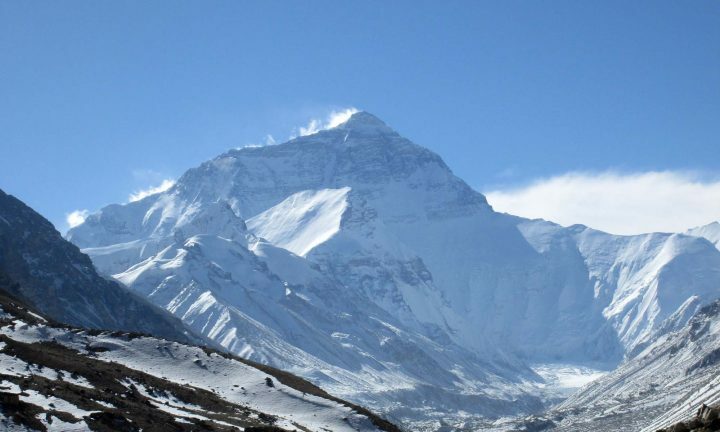 Now is the time to visit this fascinating country while it is still pristine and take advantage of The California Native’s “White Elephant” Sale. 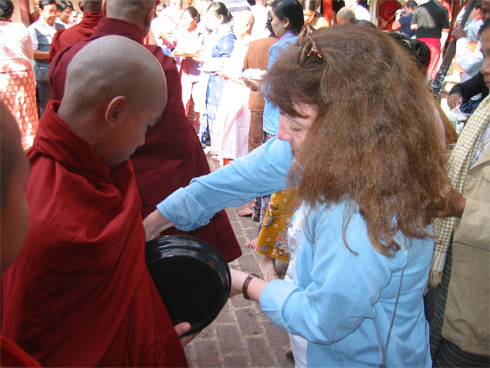 California Native, Ellen Klein, serving rice to monks in Myanmar. 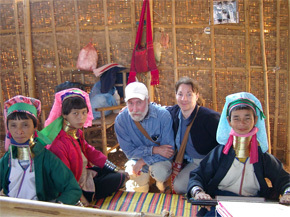 "Long-necked" ladies of the Padaung tribe with California Natives Lee and Ellen Klein, at Inle Lake, Myanmar. The recent reforms by the government of Myanmar, and the United States’ and Europe’s loosening of sanctions against this Southeast Asian country, formerly known as Burma, has portrayed the reclusive country in a more favorable light. The California Native has been conducting tours of Myanmar for the last eight years and we see this awareness in the large increase in the number of our guests traveling with us to this exotic destination. Myanmar has so much to offer the traveler. From the splendor of Yangon’s Shwedagon Pagoda to the thousands of ancient temples in Bagan and the unique “Leg rowers” of Inle Lake, the friendly people and fantastic photo-ops make Myanmar a destination well worth visiting. 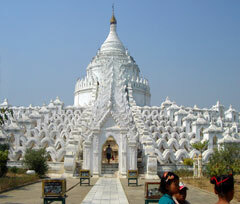 Located in Mingun (near Mandalay), the Hsinbyume Pagoda is built in circular terraces representing mountain ranges. In 1892 Rudyard Kipling published Barrack Room Ballads, a collection of poems about the life of British soldiers stationed in colonial India. It included the poem “Mandalay,” in which a lovelorn soldier longs to return to Burma and his Burmese sweetheart. While the road to Mandalay may not necessarily lead to love, it does lead travelers to a fascinating experience of Myanmar’s culture and history. The fabled city of Mandalay lies on the banks of the Ayeyarwady River. The last capital of Myanmar before the British took over in 1886, it is second only to Yangon (Rangoon) in size and lies in the center of the country. It was founded by King Mindon in 1857 in an empty area that, according to prophecy, would be the location of a town that would come into existence on the 2,400th jubilee of Buddhism. To fulfill this prophecy, the king moved his capital from Amarapura, dismantling the wooden buildings and royal palaces and loading them onto carts and elephants to relocate them seven miles south to Mandalay. The city gets its name from Mandalay Hill, which rises more than 700 feet above the Mandalay Fort. Visitors can climb up two covered stairways that wind up the hill, stopping at the shrines, stupas and monasteries along the way. Near the top is a standing Buddha image pointing to the place where the city would be built according to the prophecy. Once on top, visitors are rewarded with sweeping views of the plains, the Palace and the Shan mountains in the distance. 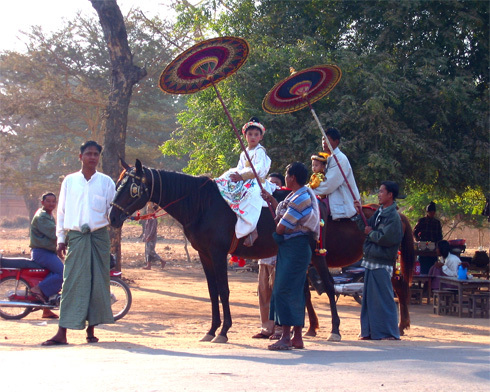 The road to Mandalay is a route studded with ancient cities, where cars share the road with ox carts and markets teem with life. Although most of the significant buildings in the ancient royal capital of Amarapura were moved to Mandalay, some interesting structures still remain. The most picturesque is U Bein’s Bridge, the longest teak bridge in the world, which stretches three-quarters of a mile across Taungthaman Lake. A stroll across the busy bridge is a great way to experience the local ambiance. At one end of the bridge is the Maha Ganayon Kyaung monastery, where thousands of young monks live and study in a strictly disciplined setting. Each day at 11 a.m. they may be observed eating their main meal in complete silence. A few miles south down the road is the ancient city of Ava (Inwa), which was the capital of the northern kingdom for almost 400 years, succeeding the nearby city of Sagaing. Both of these cities boast a number of interesting pagodas and historic sites. One of the most interesting of the ancient cities on the road to Mandalay is Mingun, where in 1790 King Bodawpaya decided he would build the world’s largest pagoda. Despite employing thousands of slaves and prisoners to build it, he died before it was completed. What remains is the massive brick base that stands over 50 meters high. Although damaged by an earthquake, it is possible to climb the ruins for a wonderful view. The king also had a gigantic bell cast—weighing 90 tons, it hangs nearby and is the largest ringing bell in the world. There is much to see on the road to Mandalay, but unlike the poem, there are no flying fishes and, alas, China is not across the bay. 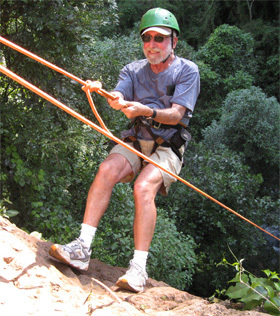 Please join us on one of our California Native Myanmar Adventures. We appreciate it when our guests share their stories with us and allow us to post them on our blog for everyone to enjoy. We loved it! 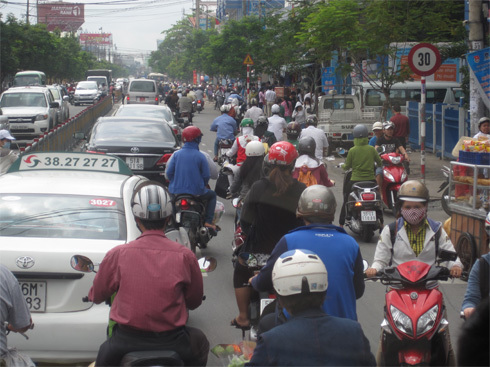 It was an incredibly well organized trip from our arrival in Yangon to when we left 11 days later. We had four guides and they could not have been more accommodating. They were educated, spoke excellent English and we had such good connection I found myself crying one time at parting (and we had no guide more than 2 -1/2 days). It is strange now in thinking I asked you about tipping because we wanted to give each a huge tip and did! And drivers couldn’t have been better as well, pulling over when I wanted a photo. The resort you put us in on Inle Lake was fabulous. I even had our boat man take us to the Princess Hotel, which is where my sister had stayed. I wanted to check out the gift shop. To my delight, our motor boat was stopped on the entry to the Hotel and a [leg rower] jumped in our boat to quietly do his one-leg rowing the entire inlet to the hotel. I did not like the Princess Hotel nearly as well as Inle Resort [where we stayed]. Yangon was very hot and humid in January but all the other cities were quite comfortable. Plus the car was always air conditioned as were the places we stayed. We were upgraded to a suite at the Trader’s Hotel and that was especially nice with the full window view of the city. The food was outstanding! Our guide ate with us and we let him order [for us] every time. Each guide handled it so smoothly. We loved having the guide and driver all to ourselves. I like the opportunity to really build a relationship among us. The excellent guides are important, as we spoke with others who had guides through someone else. They were such a strong part of our trip with our connections with them. I’m deeply into our trip and reliving it as I process my photos and edit them and get them ready to put in my 71st photo album of our life. 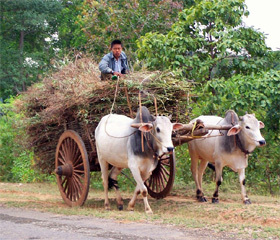 Oxcarts drive alongside the highways in Myanmar. 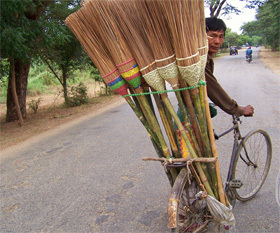 In Myanmar, an entrepreneur sells brooms from his bicycle. 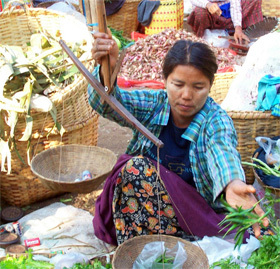 A merchant weighs produce in a marketplace in Myanmar. The white cream on her face, thanaka, is made from tree bark. 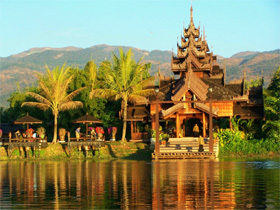 Farms, houses, temples and hotels are all located in the waters of Myanmar's Inle Lake. 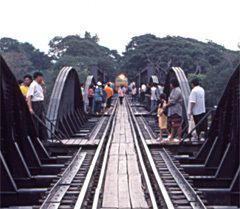 Onlookers move to the side as a train approaches the famous Bridge on the River Kwai. Most of us first heard about the bridge through the 1957 film, based on Pierre Boulle’s French novel. Set in a World War II Japanese POW camp in Burma, it is a fictional account of a battle of wills between a harrassed Japanese camp commander and a doggedly-stubborn British colonel. The story climaxes when allied commandos blow up the bridge. More than 300,000 Allied and Asian war prisoners were forced to build the railroad bridge over the River Kwai. The true story is different. During the Second World War, the Japanese planned a railway from Bangkok to Rangoon to shorten the distance between Japan and Burma by 1,300 miles. 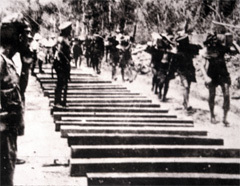 The railway would cross some of the wettest and most inhospitable terrain in Southeast Asia and require the construction of 688 bridges, but they considered it critical to the war effort. 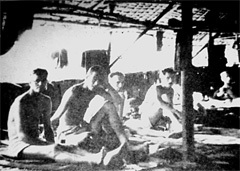 Allied war prisoners in barracks during construction of Bridge on the River Kwai. The Japanese actually constructed two parallel bridges across the River Kwai, just outside of the Thai town of Kanchanaburi—the first made entirely of wood, the second made of steel and concrete. The Allies destroyed both on February 13, 1945. In the film the commandos detonated explosive charges fastened to the bridge’s supports. The real bridge was bombed. Failing to destroy the bridges with conventional bombs (some hitting POW camps) the American flyers brought in a new weapon, the AZON (Azimuth Only) bomb. The precursor of today’s “smart” bombs, it had a radio-controlled tail and ten times the accuracy of a conventional bomb. Bangkok, Thailand, is the cross roads of Southeast Asia. Most passengers traveling to our California Native destinations of Myanmar (Burma) and Bhutan stop in Bangkok before resuming their journeys, and it is well worth spending an additional day to visit Kanchanaburi with its memorials and famous bridge.